Football games, family outings, late-night food cravings, dinner dates—there’s never a bad time for wings in Georgia. This food favorite is a staple on many restaurant menus dotting the Peach State, serving up just about every flavor you can imagine—and then some. Whether you like them spicy or sweet, fried or baked, boneless or bone-in, you’ll want to eat your weight in wings at these 10 best places for wings in Georgia. There’s nothing but flavor when you step through the doors at Jamal’s Buffalo Wings. Their humble beginnings as a small wing shack has blossomed into a full-service restaurant serving breakfast, lunch, and dinner. With every wing cooked to order, then splashed in your favorite sauce, you won’t find a better place for wings in Atlanta. Get them fried dry or doused in your favorite sauce—either way, you’ll just be glad you discovered this gem! This unique, drive-through diner-style wing spot offers outdoor seating and a walk-up counter. Wings are cooked fresh and sauced to perfection. Fans love the Philly cheesesteak and wings combo because they get the best of both worlds—a hard decision you’ll never have to make! This cozy mom-and-pop wing joint is the perfect spot for watching the big game or grabbing a drink and a meal. You’ve got your pick of bone-in and boneless wings in nearly two dozen different sauces. Where else can you get delicious wings with a side of country cookin’? Only at Felecia’s! They’ve always got a great selection of wings and other southern favorites on special, like fried chicken and fish, mac and cheese, okra, and greens. You won’t find better food anywhere else in Wrightsville. 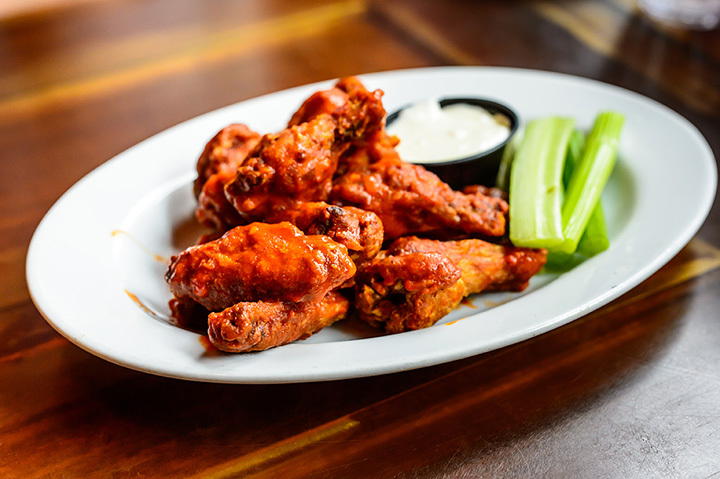 If Jumbo wings are your thing, you’ll want to order some extra at Blazer’s because they’re just that good. Perfectly sauced and seasoned to your liking, these wings will have you driving an hour or more out of your way just to get a taste. Order online to save yourself some time. Fresh, never-frozen, high-quality chicken is what sets Wing City apart from the rest, and you’ll be able to taste the difference. All 31 of their sauces are made fresh in-house to leave your taste buds wanting for nothing. As an added bonus, they also have a whopping 15 different kinds of French fries to complement your meal. Yes, you can have it all. Not to be confused with the Blazer’s in Hull, this five-location chain is packing a heat all its own. They’ve got some of the spiciest hot wing flavors you can find, along with a full suite of seafood, sandwiches, salads, and sides to please any appetite. Get the wings by themselves or make it meal—you won’t regret it. They’ve got a true passion for wings, and it surely shows. As fellow wing-eaters, they’re committing to dishing out only the best flavors and quality anywhere. Inside you’ll find a bar full of your favorite beer and wine to add the perfect addition to your wing meal. The wings here are a bit smaller than most places, but if you like them crispy you won’t want to go anywhere else. Their fans love them for keeping it simple, offering the best no-frill flavors around. Even better, they also provide catering services, and you’ll want them at every event. This charming walk-up eatery has captured the hearts and appetites of locals and travelers alike. Everything is cooked to order to ensure you get nothing but fresh, hot food. Of course, perfection like this does take a little longer, but you’ll be glad you waited.